The remake of Brighton Rock is easily one of my most anticipated films of 2011. Oddly I saw Brighton Rock on the same day as the remake of another classic and like it, the original Brighton Rock has a place in my great films category but it mostly came down to being told what a great film it was my actual experience of it was a little less than brilliant. Before I am drawn and quartered for such blasphemy I should mention that I had fully intend to re-watch the original through my adult eyes and reassess it, in the run up to the release of Brighton Rock had it not been for an odd incident which I outline in paragraph 5 below. My expectations were running high for the remake of Brighton Rock not because I loved the original film which I haven’t seen since I was knee high, or because I was a fan of Graham Greene’s classic novel, which I haven’t read - but rather because last year I was lucky enough to see some early footage from Brighton Rock whilst it was still in post production and hear Director Rowan Joffe and producer Paul Webster discuss their adaptation. The footage looked absolutely magnificent. There were some great atmospheric, taut, moody shots, British gangsters, fog, chases and knife fights. And I’m not talking about your run of the mill, hoodied east end “av a go” lads these were old school gangsters. 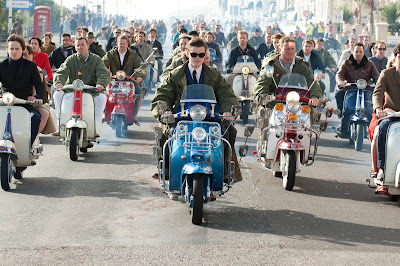 This was followed by some incredible footage of a 60s Brighton Mods versus Rocker confrontation. 3. It looked like a fresh, serious, take on organized British Crime and we are going to get a Brighton Rock updated for our contemporary post Guy Ritchie sensibilities. 4. 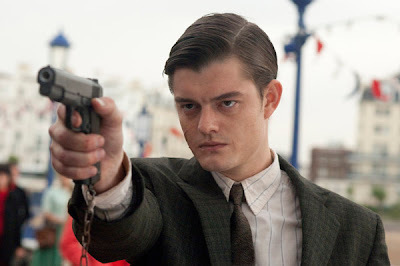 Sam Riley’s Pinkie felt like he was going to be added to the pantheon of sharp clever British anti heroes. I immediately made a note to track down the original Brighton Rock and re-watch it to get me in the mood for the release of Brighton Rock 2010. But then in the final throes of a QA session, an overzealous fan asked something to the effect of “Without giving away the ending - which ending does your Brighton Rock follow? The Book or the previous film version?" Well, the question itself a paradox and really I should have blocked my ears but I was somewhere in-between: “What possible satisfaction could anyone derive from knowing the ending of a film six months prior to its release?” and “surely someone will intervene before this madness goes any further” – unfortunately not. So although I vaguely remembered the original I was left knowing how Brighton Rock 2010 would end and couldn’t watch the original version for fear of my viewing pleasure being further compromised. Brighton Rock starts with a loud fog horn blasting reminiscent of the loud booms of the Inception soundtrack and we start over a dark ominous sea with waves surging forward. Instantly there is a dark sense of foreboding and film noir - they have pitched the tone in the exact place I was hoping it would be . This is going to be awesome. We then drop into a tense scene where a gangster is being closed in upon by a rival gang. It’s all foggy, dark, 1960s suits, hats, straight razors and bravado. As the story progresses we discover that a man dispatched early on is the head of a gang and Pinkie’s mentor. Pinkie then sets about laying his revenge on the rival gang whilst furthering his own agenda of moving up the gangland ranks - as well as increasing his power within Brighton, whose jovial seaside town veneer has a thriving dark underworld. 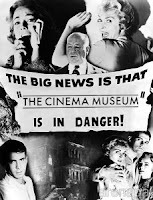 Add into the mix the changing times, you see Brighton's on the move and is expanding as an entertainment destination. But the 60s youth are carving out their own path and at odds with the older generation as well as themselves. All this combined and we are heading for a collision. The film gets the look right, not just the great clothing, spot on sets but the whole 60s seaside atmosphere. Part of this comes down to Brighton Rock having been shot with period lenses. Intentionally using the same equipment as used by the great Jean-Pierre Melville to shoot his brilliant Le Cercle Rouge, one of Rowan Joffe’s favourite crime films. 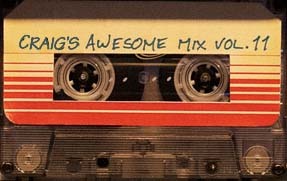 The look combined with the soundtrack makes for an effective experience on the most part. There are some flashes of brilliant acting mostly coming from; Helen Mirren and John Hurt also from Ian Curtis and especially Andrea Riseborough. There are some great scenes and interaction between characters dotted with some humour. Sometimes when you see a film with very little context you can only read it at face value and not see the depth behind it. That may be the case with my viewing of Brighton Rock. Unfortunately it seems to have all the right bits but just can’t bring them together in a compelling whole. 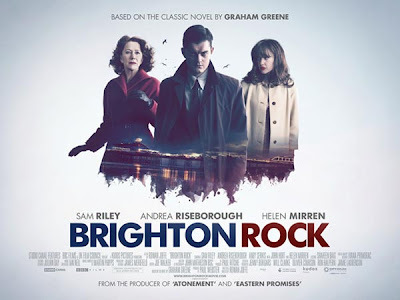 It may have worked better for me if I was more familiar with the characters and there expected trajectories within the Brighton Rock universe, but that would limit the appreciation of Brighton Rock to only those familiar with the source material. I was a bit lost regarding the moral ambiguity and motivations of some of the characters, especially struggling to understand Pinkie. He waivers between self assured criminal to in over his head juvenile ripped from his mentor too early. It’s never clear where exactly on the spectrum he is most of the time. You could say that may be the point and Pinkie is so warped that he is beyond understanding. But in reality it just meant that that set-ups lacked tension and there is never a real sense of dread or threat from Pinkie. At best he just seems out of his depth, part victim, part incompetent opportunist misguidedly bumbling from one situation to another. I can’t help but think that the performances aren’t really the issue and rather mis-direction and editing missing an opportunity to tighten the film sufficiently are the weakness at its core. In years to come Brighton Rock may move from misunderstood to an exploration of a morally ambiguous underworld and a wayward, tragic lead but I think the audience need to be more familiar with the Brighton Rock universe before this happens and it may never get the chance under the crushing weight of the much loved previous versions.